The Pelikan M600 Souverain: The lesser-loved, highly practical mid-size sedan of the Souverain line. Pelikan M600 Souverain: The Right Choice? Here’s one pen review I’ve been sitting on for the past two years, and I’m just now comfortable putting it out there. Neither the pen nor the review is particularly complex or controversial, but for some reason I really wanted to get this one right. I purchased the red/black striated Pelikan M600 from Richard Binder at the 2013 Baltimore Pen Show. While it wasn’t the most expensive pen that I had purchased to date, it was definitely the purchase I had thought the most about prior to pulling the trigger. The reason? I was torn between the M600 and the M800/M1000s that nearly everyone was urging me to buy. So, how did things turn out? I made the right choice, for me at least. Every Pelikan I’ve owned or written with is built like a tank, and the M600 is no exception. These are high quality German pens, and are designed to last. This pen has seen heavy use over the past two years, yet the action on the piston remains smooth, with no sticking or loosening of the blind cap over time. My pen has no visible flaws on the body or the trim, other than some minor micro-scratches that I consider normal wear and tear. The cap band is engraved with "Souverain," and the material has a sparkling quality to it. It doesn't photograph very well in my current lighting, but where the barrel meets the section the pen is translucent, allowing you to view the current ink capacity. My pen is in the classic striated material (either celluloid or resin, which one I'm not sure). I chose the red/black version, my all-time favorite color combination. Solid black, green striated, and blue striated are also available, along with some special editions that pop up from time to time, like this gorgeous white tortoise version Azizah from Gourmet Pens reviewed (in the M400 size). I normally keep this pen loaded with a dark red or burgundy ink. The M600 sports a 14K nib that can easily be modified to add flex. Both Richard Binder and John Mottishaw offer this option. 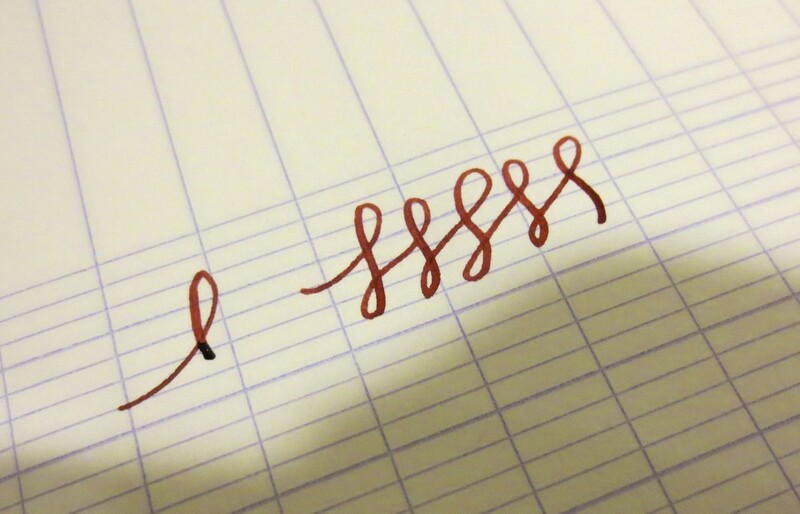 I have the standard EF nib, which I wouldn’t characterize as “flexy,” but it’s definitely soft. The nib is engraved with scrollwork and the classic Pelikan logo. One note on Pelikan nibs: they tend to run very, very wide. Prior to Richard Binder tuning this nib, the EF nib ran more like a typical western fine, or even a Japanese medium. Richard ground it down to more of a “true EF,” but you’re still not going to get .3mm lines out of this nib. Per my preference, he set the nib to write moderately wet, with the slightest hint of feedback. I save most of my pen boxes, but I’m not one of those people who pays a ton of attention to packaging. Most of the time the box ends up in the closet, where it stays indefinitely (unless I sell or trade the pen). The M600 comes in a nice Pelikan presentation box, very dignified without being overly ostentatious. 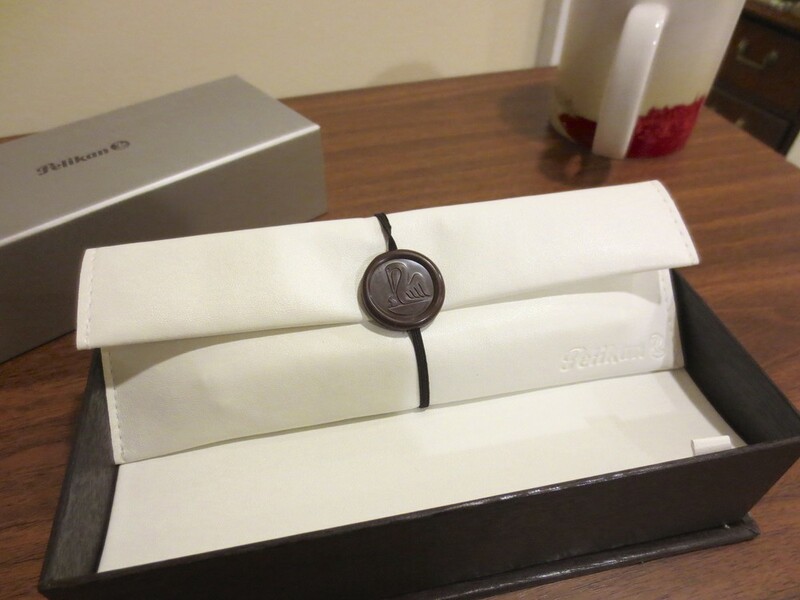 The box includes a faux-white leather pen wrap/envelope, which is nice (I suppose), although I've never used it and probably never will. (White leather is an impractical carry for things that hold ink.) Pelikan could up its game by offering its Souverain line with a bottle of ink in lieu of the "penvelope." It's not uncommon, once you get into the $250+ price range, for a pen company to offer a free bottle, especially if the pen is a piston-filler. I’m surprised that Pelikan hasn’t seized on the opportunity to market its “luxury” Edelstein line of ink by packaging it with its pens. Recently, some retailers have taken it upon themselves to throw in a bottle of Edelstein with your purchase. Check for deals! “You’ll regret buying the M600 later. Spend the extra $150 or so and get the M800. You’ll definitely want more pen.” I can’t tell you how many times I heard this from pen show attendees (and not necessarily vendors who were trying to sell me the more expensive model). So were they right? Let’s find out. The M600 is very light, posts well, and fits perfectly in a shirt pocket. It’s a great daily writer and a workhorse. I found the M400 slightly too small for my hand. The M600 was a better fit. For an illustration of the size of the M600, see the gallery below. The M800 is a large, heavy pen. I don’t find that it fits easily into a normal shirt or jacket pocket, and it’s very long and top heavy when posted. The same thing goes for the M1000. I don’t know of anyone who posts the latter. The 14K nib on the M600 is much softer than the nib on the M800, which I found stiff. On the larger end of the spectrum, however, the M1000 nib is very soft and provides decent line variation. The M600 nib units are interchangeable with the M400 and, I believe with the M205. If you have other compatible Pelikans, you will get decent mileage out of any additional nib units you buy, which can mean serious savings (especially if the nibs have been modified or customized by a nibmeister). The M800 nibs units are only interchangeable within the M800 line; likewise for the M1000 nib units. All of the pens in the Pelikan Souverain series are piston fillers with good ink capacity. I’ve not measured the ink capacity of the M600, but one fill gets me through two or three days of writing with this pen exclusively, and if I’m carrying more than one pen (which is most of the time), a single fill gets me through a full week. I purchased this pen from Richard Binder, who unfortunately is no longer retailing Pelikan pens (though he does still sell and modify replacement Pelikan nibs). Pen Chalet has excellent prices on Pelikans (the standard M600 currently retails for around $400, minus applicable discount codes). 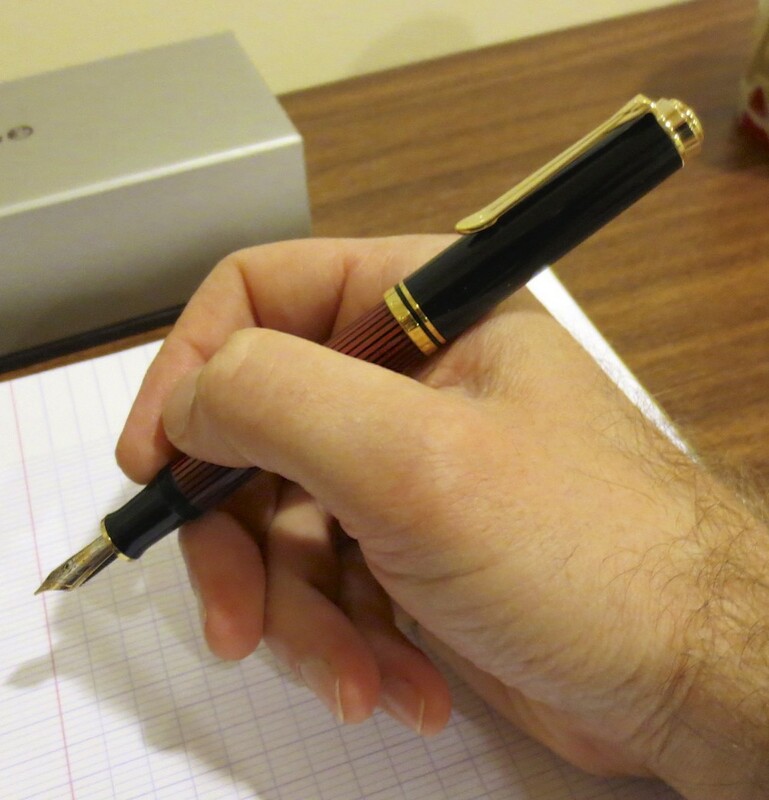 If you are looking at purchasing a Pelikan pen from a nibmeister who will tune the pen prior to shipping it to you, I would recommend visiting John Mottishaw at Classic Fountain Pens. For another take on this pen (with a BB nib) and a look at her drool-worthy collection of Pelikans, check out Azizah's review of the red/black M600.